Advanced premium quality oil with Synthetic Technology. Beats key competitors by finishing 5 metres ahead in just 30 seconds* on acceleration, when tested in simulated real-world riding across a range of temperatures and speeds. 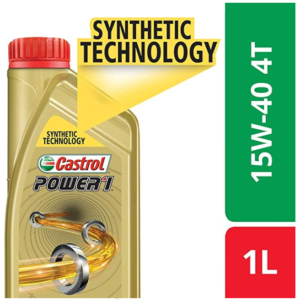 Vehicle compatibility where Castrol recommends***15W-40 oil such as – Suzuki V-Storm, Mahindra Centuro, Mahindra Centuro Rockstar, Mahindra Pantero, Mahindra Stallio.